What does unattended sorrow look like? It is like a low-grade fever; it troubles our sleep and drains away our days; it scatters intuition and creates an underlying anxiety; it sours the eye and leaves a distaste in the mouth; it's the vague uncertainty that permeates every thought before every action; it's the heart working as hard as it can. It's what most of us carry with us from day to day. 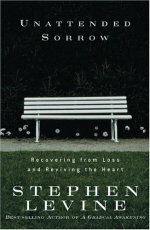 And it's what renowned grief counselor Stephen Levine, author of Who Dies? and A Gradual Awakening, focuses on here. He writes that long after the initial loss has passed and the "period of grieving" has ended, an unattended sorrow lingers, accounting for a host of physical, emotional, and spiritual maladies. It's not uncommon, then, for those with unresolved grief to lean towards addictions or dangerous behaviors or other forms of self-destruction. Levine addresses the grief from fresh loss but also attends to the pain and troubles caused by the unresolved anguish, sadness, and delayed stress that can accumulate over a lifetime--whether it's angst caused by death, the loss of self-identity, childhood abuse, illness, divorce, or even just being alive in today's world. Levine notes that though we may never wholly overcome the sorrows we've endured, we can confront them with mercy and self-acceptance that smoothes the path to healing the heart.